"The Third Man" might just be the absolute greatest film noir ever made. A stunning potboiler about an American man investigating the death of his friend in post-War Vienna. Carol Reed’s contrasty black and white skewed frames, sharp political wit and one of the great third act reveals in history make the film essential viewing for anyone who likes watching movies. The political jungle of post-war Vienna is seen from the point of view of Holly Martins (Joseph Cotton). As the narrator (an omniscient one in the British version and Joe Cotton in the American) tells us, Vienna is divided into four quarters, British, American, Russian and French, with no one speaking the same language. Out of greed and necessity a black market for almost anything has emerged and with it all the nefarious smarmy characters we expect from a film noir. Martins arrives in Vienna summoned for a job by his friend Harry Lime, unfortunately immediately discovering Harry was recently been hit by a trolly and died. But as Holly meets and questions the supposed witnesses to the event shifty eyes, and inconsistent recollections point to a conspiracy. With investigative sleuthing Holly uncovers a plot which involves illegal black market pencillin, and eventually, the discovery, of well… it can’t really be a spoiler 60 years later can it?…. Harry Lime himself still alive having faked his own death. Graham Greene, the great novelist and screenwriter, is careful to unfold the story. Everyone seems to be on edge and untrustworthy of anyone. The antagonists in the story, a trio of black marketeers, are sophisticated and blend in with the refined polish of their British pursuers. The primo of polish is Harry Lime, when he’s eventually revealed, played by Orson Welles as one of the most famous villains in film history. When we first see Welles, he gives Holly, and the audience, a devious little smirk, before disappearing off into the night. And his dialogue with Joseph Cotton on the ferris wheel is one of the great exchanges in cinema. Cotton and Welles, two old pals from the Mercury theatre, Radio, Citizen Kane and Magnificent Ambersons, bounce the lines off each other with natural ease with Welles using his body language and subtle innuendos in conveying Lime’s threats to Martins. Carol Reed’s nighttime shooting of Vienna embellishes all the noir-ish texture of genre. The desolate streets and underground sewer systems which the characters chase each other through are lit with harsh contrasty light placed low to the ground creating long ominous shadows and highlighting the rough cobblestoned streets. It’s unnatural but a distinct exaggerated expressionistic aesthetic. I’ve never heard this said, but I can’t help but think the starkness of Welles’ own “Touch of Evil”, made years later, was influenced by “The Third Man”. If not by the stylish camerawork, then the use of the city locale as a character or the distinct and discongruous musical choices of Anton Karas and Henry Mancini. Great Movie. You implied but should have said that this movie was shot on location in Vienna only a couple of years after WWII and the war devastation is still very much evident with piles of rubble, bombed out buildings, and broken furniture scattered throughout the landscape. Definitely adds to the "noir" of the film. I was blown away by this film when I watched it for the first time about a year ago. After Welles utters the cuckoo clock line, I had to pause the film and take a break (I felt like I had an out of body experience); then I rewatched that scene and finished the film. The Third Man is one of my favorite films, but I think you err by referring to it as Film Noir. 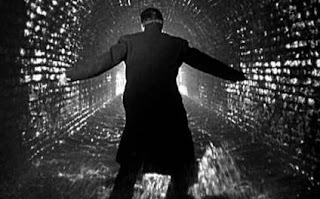 I don't want to get all specific on you because I like your writing a lot and look forward to the e-mails, but Third Man has more in common with German Expressionism than Noir. At least in the way it looks. Thematically, what leads me to think Third Man is not Noir is the fact that the hero Holly (Joseph Cotten) is an innocent dope. He's totally at the mercy, not of fate, but of the machinations of everyone else in Vienna who see him for the chump he is. Why do you think Harry Lime invited him? He was the perfect fool. That's most unlike a Noir hero, who can be taken advantage of and can be left to the hands of fate, but could you imagine Robert Mitchum, Bogart or even Fred MacMurray playing Holly? I can't.